T&C: Deposit required. Play at least 50 game rounds on any Live Casino games within 24 hours to qualify for 25 % Cashback on your net losses up to €/£100. Valid for 24 hours. New 18+ customers only. Gamble responsibly. Full T&C. 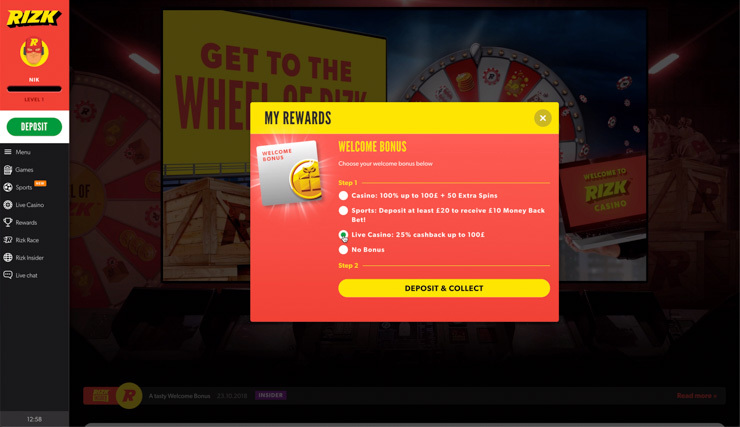 Rizk casino has boosted its welcome bonus yet again. This time it’s something that Live Casino players have been waiting for quite a while. And understandably so, because Rizk has state-of-the-art live games from Evolution and NetEnt but no dedicated live casino bonus to match. Until now. 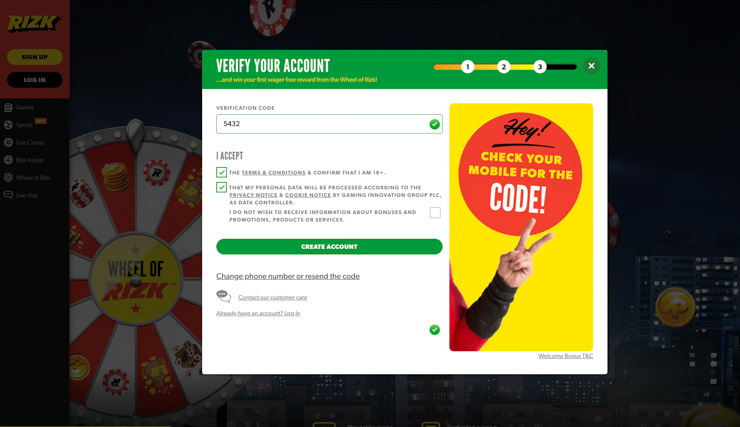 🦸‍♂️ Rizk Live Casino Bonus: Get 25% Real Money Cashback up to £/€/$100. Just create an account, choose the welcome bonus and make your first deposit. 1 Register an account with Rizk and verify your phone number. Register on desktop or mobile and verify your phone nr. 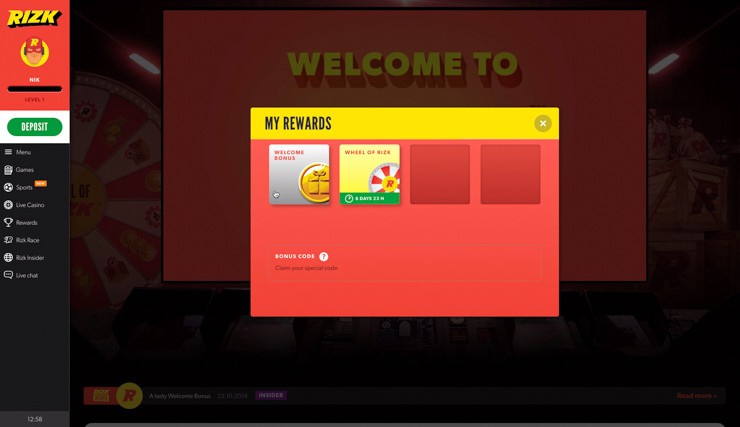 2 Choose the Welcome Bonus offer from the Rewards section. Choose the left one in this case. 3 Pick the Live Casino Welcome Offer from the new list. New Live Casino bonus will appear: click to claim it! 4 Deposit using one of the available payment methods. Choose a payment method and proceed with the first deposit. 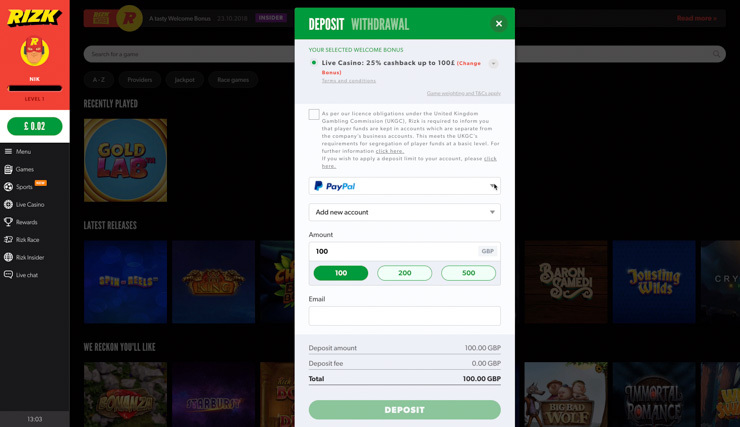 5 Play at least 50 game rounds on any Live Casino games within 24 hours to qualify for 25% Cashback on your net losses (bets minus winnings) up to £/€/$100. 6 Claim your Cashback in your Rewards section within 7 days. Of course, no wagering requirements apply, so you can cash out the entire bonus right away. In other words, if you play and lose £/€/$200, Rizk will give you £/€/$50 free money. If you lose £/€/$400, Rizk will pay the maximum of £/€/$100. The Live Casino features everything from roulette to blackjack, baccarat and Dream Catcher. And did you know Rizk also has exclusive live tables like European Roulette Pro? You can play any of them with the deal without limitations, on mobile and desktop. So, that makes it x3 welcome bonuses to choose from, including one for sportsbook goers and one for casino fans who also enjoy slots. However, only one of those offers is available per player when they open an account. But, there’s one bonus which applies to ALL new Rizk customers – the signup bonus. Free Spins win: choose from x4 slots to play 10 wager-free spins! 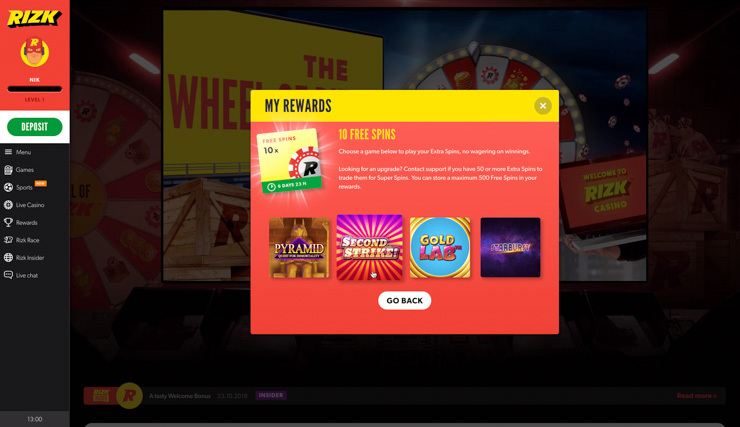 All you need to do is pick the Wheel of Rizk reward next to the welcome bonus, spin the wheel and win anything from 10 Free Spins and up to £/€/$25 in real cash, guaranteed, without BS terms. 🚀 Sign Up: Get the free bonus on registration. New 18+ customers only. Gamble responsibly: BeGambleAware®. Terms & Conditions.